This is a continuation of a travel series to Savannah, Georgia. If you'd like to start at the beginning, go HERE. The rest of the posts in consecutive order are HERE, HERE, HERE, HERE, HERE, HERE, HERE, HERE, and HERE. On our last day in Savannah, we went to Tybee Island. We spent the morning at Fort Pulaski, had lunch at The Crab Shack, and then we headed to the beach. We first stopped at North Beach which had the cutest lighthouse and light keepers cottage. It is so charming, isn't it? The lighthouse is the oldest lighthouse in Georgia, built in 1736. It is 145 stories tall and actually has three light keepers cottages nearby. You can tour the lighthouse, museum, and military battery for $15.00. Because we just toured Ft. Pulaski we did not take the tour; we wanted to save some time for the beach! Right across the street from the lighthouse is the 1899 Military Battery. It also houses the Tybee Island Museum. You can also access Tybee Island North Beach from this area. We stopped briefly at the North Beach and we also went to Tybee Island Beach. Both are very nice, but North Beach is much more secluded and less developed. I was so happy I wore this dress on the day we went to the beach. I loved the way the wind whipped it up into the air. It barely got wet, because the wind was always lifting it. We found this sea creature laying on the beach. We were not quite sure what it was, some type of sting ray? My favorite part of the beach is always bird watching. I just love all the different types of birds at the ocean. Next we drove down farther to Tybee Island Beach. This area is much more developed and where more of the action is. It's still quite small in comparison to other beach towns, but we liked it that way. It was very quaint. This is the main drag across from the ocean where all the gift shops and restaurants are located. The best part of Tybee Island is that they have a free public pier. You would be surprised at how many beach communities we've been to that don't have a free pier. Most have a fee required to walk on or fish from. At the start of this piers this large, octagon pavilion where food is served and music is performed. We had the exciting experience of watching some fisherman catch and release this large sting ray. This picture was taken from the pier looking back at the beach. You can see how much more developed it is that North Beach. I love to see Pelicans flying in the air. After spending some time on the beach and pier and visiting a few gift shops, we got back in the car and drove around a bit. We loved all the gorgeous beach homes. Most of these are available to rent for tourists. And finally, I have a funny story to share. The entire time we were in Savannah my husband wanted a fish fry. Now Savannah is filled with seafood restaurants, but we couldn't find a fish fry on any of the menus. I don't know why. We saw a lot of "Shrimp and Grits" and stuff like that, but no traditional fish fry. Well, when we stopped at The Visitor Center there was a sign advertising Fish Fries at the American Legion Post. It said "All Are Welcome", so we went and finally had our fish fry; and it was delicious! We laughed and laughed through the entire meal. We said that only we would end up at an American Legion post for dinner on a vacation instead of a fancy restaurant. And the funniest part was when we left we saw a truck from The Crab Shack outside. They catered the fish fry! No wonder it was so good! It was the best Fish Fry I've had in my life. It was lightly breaded, so I could really taste the fish and not the breading. And it tasted so fresh, like it was caught that day! And this concludes my Savannah travel series. Our next vacation will be in September where we will be headed to South Dakota to explore the Black Hills, the Badlands, Mount Rushmore, Custer State Park, and much more. In the mean time, I will share a few local adventures we've had this summer. What a cute little beach town! I love your dress too, it's beautiful and flowing! Thanks Brooke! 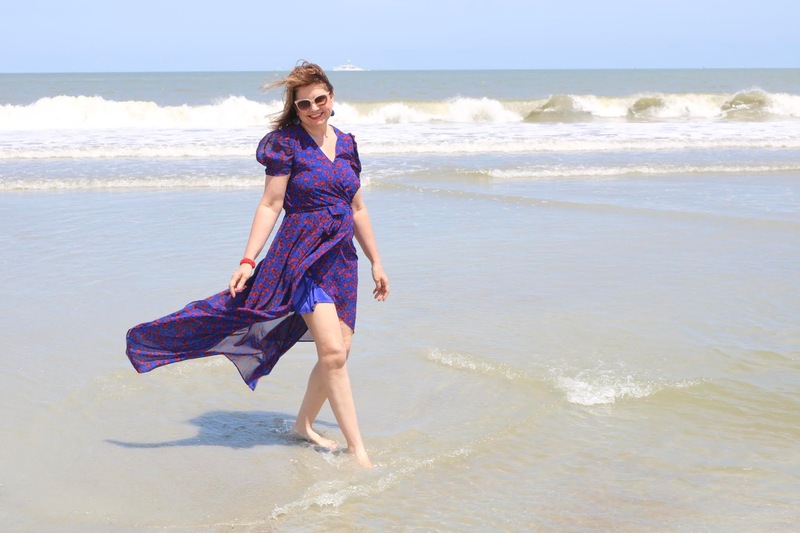 That dress was a great find and perfect for a day at the beach. Tybee Island is just a stone's throw away from where I live in Florida. Your pictures make me want to visit. Thanks for sharing. Oh, if it's close to you, you really should visit. It's so charming! Some more great pics, Amy, especially the birds. What a great holiday you had there. And how weird that you struggled to find fish on the menu! I know, that's what we thought. We are from the north in America, and we have what is called a "Fish Fry" every Friday, I think it's because there are a lot of Catholics in our geographical area. But we couldn't find a "Fish Fry" on any of the menus of any of the restaurants we went to. They did have fish, but nothing we would consider a traditional fish fry. I love lighthouses and your photos are all so lovely, I feel like I'm there with you. Thank you for sharing with us at #MLSTL and have a great weekend! It looks like a lovely place to visit Amy and those "beach houses" were beautiful. I always think of little get-aways not those gorgeous mini-mansions that people seem to build these days. Still, if I had enough money for a beach house on an island maybe I'd build a mansion too! Oh I know, when I see huge homes my first thought is "Who would want to maintain all that?" But then they probably have a lot of staff do it for them. At this stage in my life, I'm more drawn to cute cottages than large homes. I have never been to Savannah but would love to go. It is on the list for my sisters and I to visit at some point. I look forward to your South Dakota posts, husband and I wanted to head that way this winter but with his diagnosis we aren't going to make it. Oh, I'm so sorry you didn't make it to South Dakota. Maybe you will yet. We only live about 10 hours from South Dakota and we have planned on going numerous times but we always had to cancel our plans because something else came up. So we're pretty excited we finally are getting to go! I just love lighthouses! The one on North Beach looks like it has really been kept up nicely. Ahh, that food looks so good, no wonder it was catered by the Crab Shack. :) I love how the house have porches on the front. Yes, I love lighthouses too! We thought it was so funny that our fish fry was made by the same restaurant we went to for lunch. And aren't those porches just gorgeous? These photos are beautiful! It looks like you had an amazing time! Yes we did! Thank you Laura! It's a shame about that poor stingray though on the beach, looks like it's been cut in half! Sad side to your trip. Yes, the houses and beach were so beautiful. Really? You think the stingray was cut in half? I don't know much about sea creatures, so I wouldn't know but I think I see "eyes". What a cute beach town with all the pretty homes and shops! The dress was perfect for pictures on the beach! How fun that you finally get to go to South Dakota. We loved it there! Watch out for rattlesnakes in the Badlands! We never saw one but heard them constantly. Thanks Ellie! I'm so happy to hear you loved South Dakota, it seems everyone enjoys it there. I've never heard a negative review. I'm not sure we will spend that much time in the Badlands, other than drive through it. I've heard so much about the snakes, I don't know if I'd enjoy hiking it. We have a lot on our agenda to get through in the the 5 days were there. Thank you so much for the information. And your pictures are awesome. My son and daughter in law just moved from Michigan to Florida as they both are CPAs and got new jobs there. This looks like a good place for hubby and I to visit on our drive to Florida. As empty nesters we take our vacation in September. Thanks Pamela. Oh, if your empty nesters like us you will love Tybee Island. It's so peaceful and such a quaint community. Not your typical "party beach" atmosphere that you find in a lot of coastal communities. Of course, we were there during the off-season, but it sounds like you will be too! How fun that you named your daughter "Amy". I find it interesting that it is a name that hasn't aged out. My college roommate named her daughter "Amy" 30 years ago, and it's still a popular name given to babies today. Great choice! I would love to visit Savannah sometime. Thanks for stopping by and posting on my Wed link-up. I'm going to try to have one every Wed. Awesome, I will be sure to pop by and link up! Tybee Island is simply beautiful. I enjoyed seeing your photos and reading about how you liked it. We toured that lighthouse and climbed to the top - I got a little dizzy on the way up! Too funny about the fish fry and yes, The Crab Shack has great food! Lucky you! I wish I could go back someday. 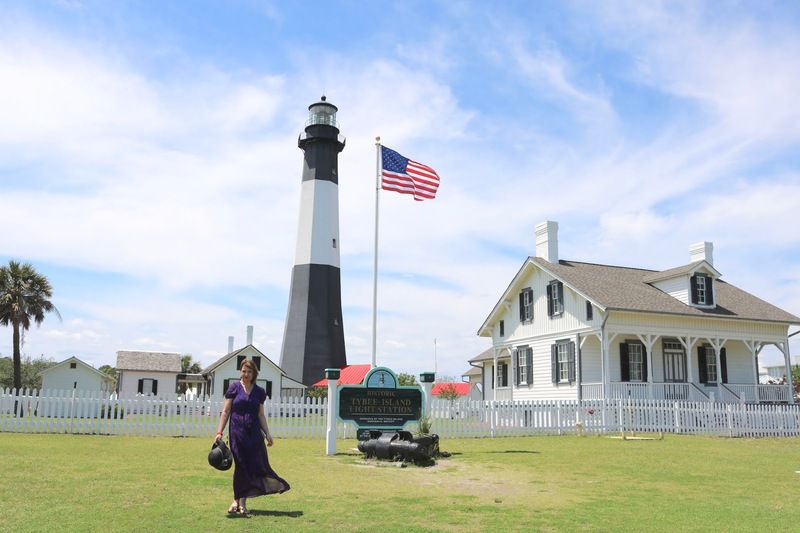 I would stay in a cute cottage on Tybee Island and I would definitely visit that lighthouse! Thanks for taking part in the "Travel Tuesday" meme. Thanks Nick! And thanks for the info too!